Among the bustling streets of Sao Paolo, Brazil are small metal carts offering mortadella sandwiches to passersby. These simple and unassuming meal is a staple for Brazilians. Its a quick and delicious bite to eat that can be enjoyed for breakfast, lunch or even dinner. Perfectly toasted French bread is piled high with thinly sliced mortadella, the Italian cousin to bologna, and mozzarella cheese, and sometimes a fried egg. 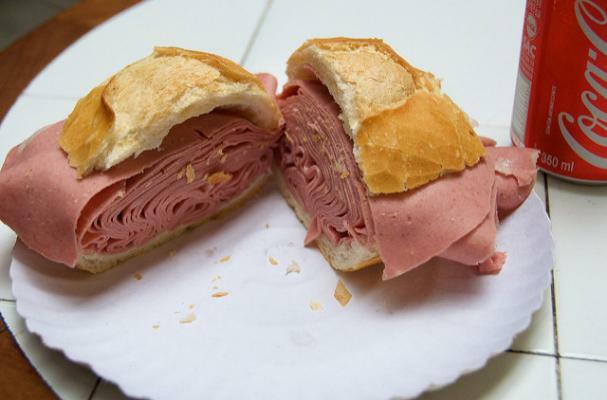 The mortadella is fried on a flat top before tucked into the bread. Condiments such as requejao (the Brazilian version of cream cheese) and mayonnaise are available but unnecessary. Step 1: Preheat the oven to 350 degrees Fahrenheit. Place loaves in the oven to warm them. Slice into 6 inch pieces and set aside. Step 2: Heat a griddle or large saute pan over medium high heat. Layer 4 to 5 slices of mortadella and cook until just beginning to turn golden brown. Step 3: Add a slice or two of mozzarella cheese on top and place a lid on top to help the cheese melt. Step 4: Using a spatula, remove the mortadella and tuck it into the bread. Serve with condiments and fried egg if desired.